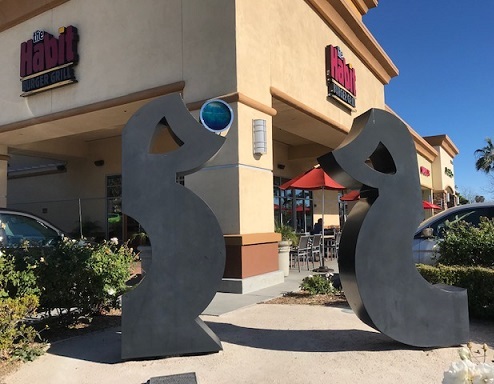 I notice and yet don’t notice (you know how it is) this art piece outside The Habit in La Verne. On a recent visit, I noticed and took photos. It’s titled “The Angle of Repose,” was installed in 2008 and was by artist Stephen Elicker. 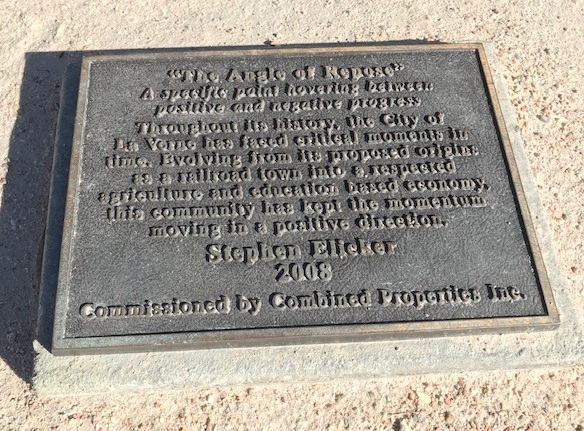 Click on the photo below for a more readable view of the plaque. It seems to be two abstract animals — cats? seals? — tossing a ball back and forth. But that’s just what I see. 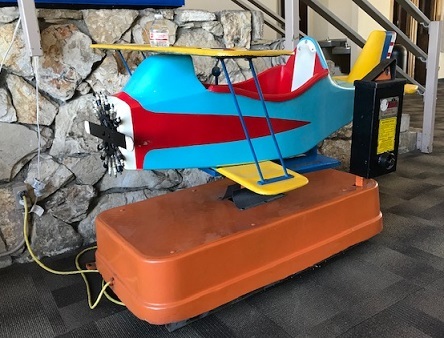 This coin-operated biplane sits in the Brackett Field Administration Building in La Verne, right below the entrance to Norm’s Hangar restaurant. It points toward the airfield, and freedom. Someone left a small bottle of water on the top wing, which may count as beverage service. 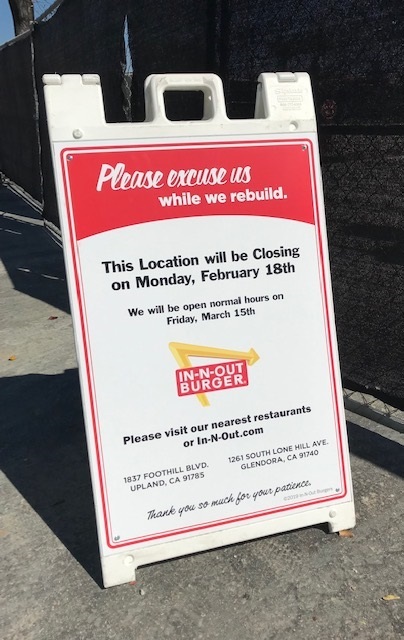 You may have read that the In-N-Out in La Verne has closed briefly for renovation. My colleague Liset Marquez had that story last month. 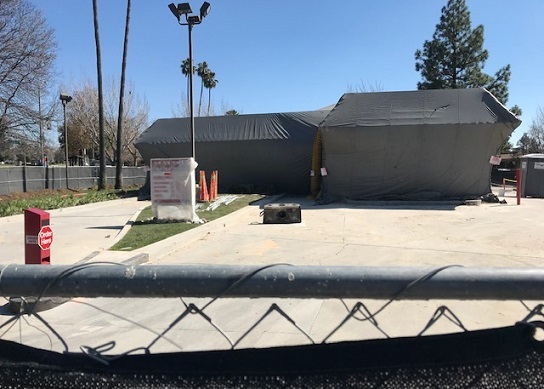 I was driving by on Foothill Boulevard Feb. 24 and was greeted by the unusual sight of the restaurant fully wrapped, as if it were being fumigated, or as if Christo had turned it into an art installation. On my way back, I pulled into the lot to take a few photos just for the novelty of it. “We will be open normal hours on Friday, March 15,” the sign below promises. This In-N-Out opened in 1977 but is considered Store No. 3 as the chain moved its third store there from Pomona, where it opened circa 1952 (records are scarce). In-N-Out had attempted to open a restaurant in La Verne in 1975 but was, rather astonishingly, turned down, a story told in my column in 2018. Oh, and Gustavo Arellano caused a stir last November with an essay in which he declared In-N-Out’s burgers “so-so.” Read his take here. Personally, I like one now and then, but as a transplant to California, I’ve always been of the opinion that you had to have grown up eating In-N-Out to love it. A new venture would fly long-distance commuters between small airports like Brackett Field to ones closer to their jobs for a monthly fee. I went up on a demonstration flight for Wednesday’s column. I got interested in the old Mt. Baldy Drive-In after the Fair had a tribute to it. So I did some research on its history, the results of which make up Wednesday’s column. If you remember the drive-in, feel free to tell us about it in the comments. The small, 1960s chapel on La Verne’s Bonita Avenue is slated to be demolished late next year after construction of its replacement. I pay a visit and pay tribute in Sunday’s column. A woman in La Verne made a point of sending me a birthday card and phoning me for a long chat several years running. She was nice. She died recently, and I wrote a column about her. 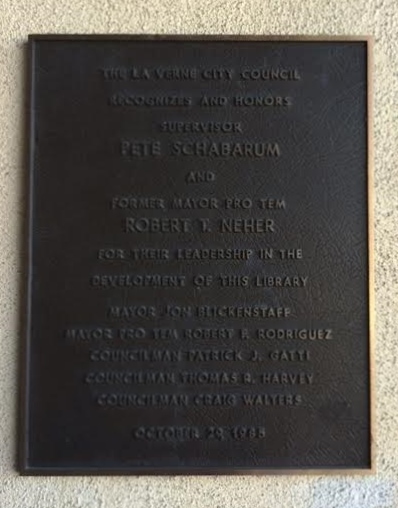 The La Verne Public Library doors were mentioned in Friday’s column about the new council chamber emblem. They were both done by woodworker Ruben Guajardo. I was told about the library work last November while doing interviews at City Hall and took the opportunity to walk across the parking lot to take a look. Check out those doors! They were made, I’m told, out of a beloved oak tree that stood in front of La Verne Heights Elementary School and that had died. 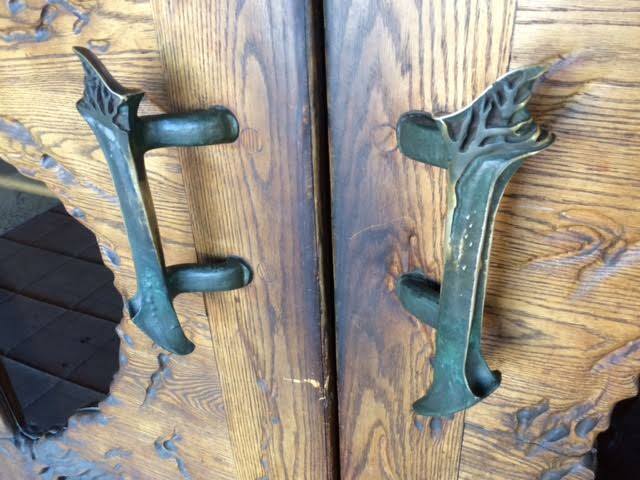 Even the door handles are unique. The library was dedicated in 1985, according to a plaque. 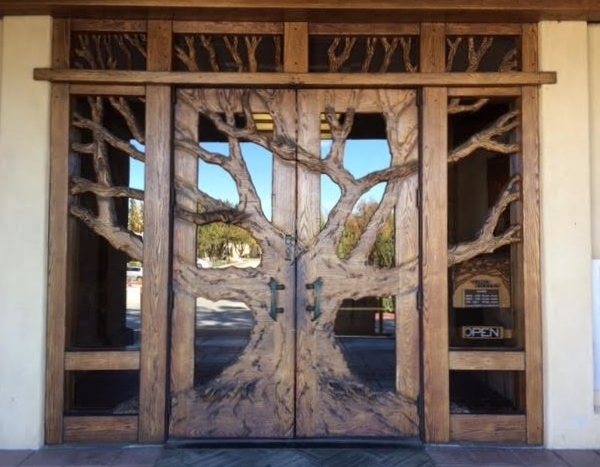 It’s a county library branch, but thanks to the doors, it’s got some personality. The rest of the interior is very 1980s. 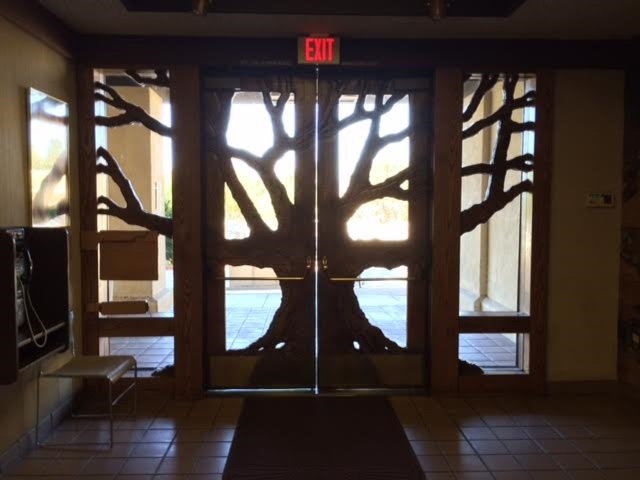 But the lobby offers a striking silhouette of the doors. 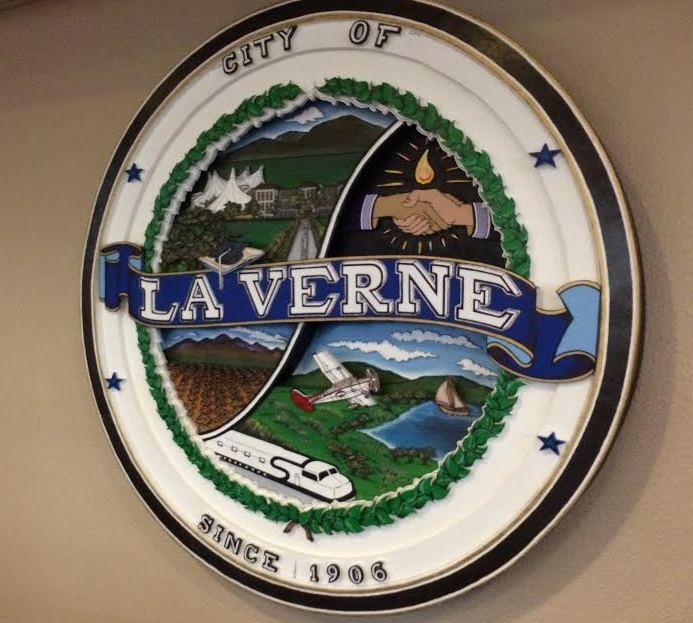 Following up on the exciting developments on the La Verne council chamber emblem front, I write about the new art piece in Friday’s column. It’s a cute story about the piece, which is an update of the confusing city seal, and about the publicity-shy artist behind it.